Craig served as the host of Assembly '18 (previously titled Capitol Events) on WCVE PBS Television, presenting daily updates on legislative issues during the General Assembly session. Craig has conducted exclusive interviews with former President Barack Obama while in office and with former President Jimmy Carter. In 2014 he provided daily national coverage of the trial of former Governor Bob McDonnell for NPR. In 2016 he travelled to Havana to cover and provide daily broadcast updates of Governor Terry McAulliffe’s trade mission to Cuba. Rachel Maddow Show on MSNBC. Craig Carper has served as a moderator or panelist at broadcast debates for U.S. Senate, Congress, Mayor and other state and local elected offices. Craig has covered the administrations of four Governors, the 2009 and 2013 gubernatorial campaigns, the 2012 and 2014 U.S. Senate races, the 2012 Presidential campaign. Former Governor Terry McAuliffe says he won’t seek the Democratic nomination for President, because he’s got work to do in Virginia. General Assembly Completes Work and Adjourns. Our News Team Takes a Look Back at the 2019 Session. The WCVE News team Takes a Look Back at the 2019 General Assembly session. Read more about General Assembly Completes Work and Adjourns. Our News Team Takes a Look Back at the 2019 Session. A bipartisan legislative investigation into sexual assault allegations against Lt. Governor Justin Fairfax can’t seem to get off the ground. A last minute maneuver by Democrats to resurrect the Equal Rights Amendment for a floor vote in the Virginia House of Delegates has failed, weeks after the bill originally died in committee. Both chambers of the General Assembly have now approved legislation that would ban localities from adopting sanctuary city policies that would restrict the enforcement of federal immigration laws. Richmond Mayor Levar Stoney, School Superintendent Jason Kamras and members of Richmond’s legislative delegation are pushing House and Senate budget conferees to restore at risk funding for low-income school districts. The recent discovery of a racist photo on Governor Ralph Northam’s 1984 Eastern Virginia Medical School yearbook page has drawn calls for his resignation from every corner of the Virginia political establishment and beyond. The photo shows one man in blackface and another hooded and dressed in Ku Klux Klan robes. residents has been killed by the Senate Education and Health committee. 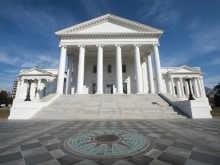 A bill that would have granted in state tuition to some undocumented Virginia residents has been killed by the Senate Education and Health committee. A new bill would increase the penalty for those who do not move over while first responders are stopped at the side of a highway to a misdemeanor reckless driving charge.